A group of makers has been quietly building a community space here in Chico with great potential for democratizing the tools of innovation and expression. After months of planning and hard work, Idea Fab Labs, Chico’s first makerspace, is opening its doors May 4th. Makerspaces—open, social spaces designed for brainstorming, collaborative learning, tool sharing, and most importantly, making things—have a long tradition in technology communities around the world. They provide the space and both standard and high-tech tools, as well as the knowledge of how to use them, in a collaborative, open environment where experimentation and peer-to-peer learning thrives. Idea Fab Labs has taken the makerspace concept one step further by offering a much wider range of modern tools than are traditionally available: an industrial laser cutter, a CNC router, a 3D printer, textile and leatherworking equipment, a wood shop, and a metal shop, in addition to the standard microelectronics workshop. It is a digital fabrication facility, giving the community an opportunity to work with specialized tools that are ordinarily out of reach for hobbyists or small businesses, learn how to use them, and build prototypes of their ideas, either for personal or commercial purposes. Idea Fab Labs sprang from a collaboration between Erin and Kristina Banwell, Jordan Layman, Billy Hopkins, and Sean Mitchell, all Chicoans who embody the maker spirit. After visiting makerspaces elsewhere and seeing the amazing work they’ve published online, they wanted to build the ultimate makerspace here in Chico. Rather than waiting for someone else to come along and do it, they and their friends got their hands dirty renovating an industrial space south of campus, buying equipment and finding like-minded collaborators. The widespread availability of information, hardware and software designs, source code, and scientific data openly available on the Internet has led to an explosion of innovation in recent years, and it’s never been easier for a self-motivated individual to apply what they’ve learned by building on the work of others. In the software and hardware world, this is known as Open Source. As opposed to the traditional system of locking up information behind patents for monopolization, Open Source software and hardware designs make the results of your innovations freely available for others to build on, usually with little or no licensing restrictions. This has sped up rate of innovation to unprecedented levels—clearly a net benefit for society. For small businesses, the advantages of prototyping at Idea Fab Labs are clear. In the prototyping stage, it is not uncommon to go through dozens of iterations before perfecting your design for manufacture. To purchase high end prototyping equipment for a speculative venture, not to mention the space and electricity to use it, would be prohibitively expensive for most small businesses, but having it available on a rental basis at low cost, not to mention having other smart individuals to bounce ideas off of and troubleshoot problems, is a clear advantage. The lone inventor previously discouraged from testing out his/her designs because of high initial costs can now begin a rapid prototyping cycle, perhaps using the result for fundraising. The first such artist residency is in progress. David Seied, a computational/architectural 3D designer from Denver is working with Erin to discover what these tools can add to his already impressive body of work. 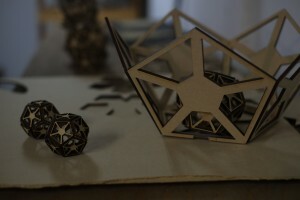 Seied works with 3D modeling software to create complex geometric shapes. He is becoming well-known for his designs printed in steel and sandstone. He worked as an intern for Marc Fornes and THEVERYMANY, an impressive computational architecture project, on an installation at the Denver Botanic Gardens. The gallery opening for the Seied exhibit will be held on May 4th at Idea Fab Labs (603 Orange Street) from 3-6pm. Anyone interested in Seied’s art or the lab itself is welcome to drop in. Art will be available for purchase. Following the opening, the exhibit will be open to the public through June 1st. Chico is a fun loving, community oriented town, a place where it’s easy to build relationships, so it’s only natural that our emerging tech community have a space that embodies that spirit. As Erin told me, “part of what makes Open Source work is that it’s social. This is a social setting. People come here to have fun and hang out with their friends and to build cool stuff. So maybe on Friday night instead of going out and taking three shots of the cheapest whiskey they got on the shelf, let’s all go work on our laser shooting robot helicopter.” Many important innovations have historically come out of that same spirit of playfulness, which is one of the reasons I’m so excited about the emergence of this space. Idea Fab Labs has the potential to be a hub of innovation and entrepreneurial activity in Chico and the North State region. With such a wide variety of equipment available, it will likely become a crossroads of sorts for groups of people that may not ordinarily interact or work together. I would argue that the most interesting ideas come from a multidisciplinary approach that will be enabled by this type of cross pollination.